Chemical analysis kit used to assess soil pH, and sometimes soil nutrients, for the purpose of making fertilizer recommendations (type, quantity, and frequency). 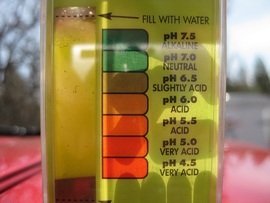 A soil pH of 6.0 to 7.0 is usually ideal. Most fertilizer packages come with charts to help homeowners determine how much fertilizer is required and how often it is needed based on the pH of their soil. You can buy a DIY pH soil test kit from a hardware store for approximately $10 to $25. State university lab tests generally cost around $20. Commercial lab tests can cost more than $100, depending on how much information you desire. Professional soil testing starts at about $300 for most single-family homes.